Caution: The precision machined edges of Poly-Classic Craftsman column components can be extremely sharp. Use of appropriate personal protection equipment is required. Install blocking around load bearing post (use pressure treated lumber.) Final width of blocking must be same width as inside of column. Install blocking around center and top of post to match step 2. (Center blocking is optional.) Blocking may be attached to deck/soffit instead of post if necessary. Trim shaft pieces at least ¼” shorter than opening height (from step 1). Trim ONLY from bottom - top end is marked. If you are going to use screws, pre-drill/countersink all panels. See joint diagram on next page to determine which edge to pre-drill. Assemble three panels, using E-Z lock joints. Or if you are not using screws, finish nail three panels together. Place the partially assembled (3 panels) column around post and blocking. Apply adhesive to final panel and attach to shaft using E-Z Lock joints. Screw or nail final panel in place. Apply adhesive to mitered ends of base moulding (9¼” tall) and assemble around bottom of column shaft. Fasten joints on base with screws or nails. There are TWO methods of attaching the cap. First, apply adhesive to mitered ends of cap moulding (7¼” tall) and assemble around shaft. Screw or nail joints. Caulk edges of base, cap, and nail or screw holes. Clean surface of column with cleaner recommended by the paint manufacturer. Paint with 2 coats of acrylic latex paint. Please note the correct assembly of the E-Z Lock joint shown at the left. The screws or nails MUST be installed only in the edges shown (3 and 4). Installing on the other edges may result in open seams. (Pre-drill if using screws.) 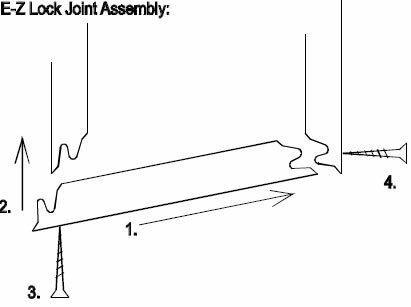 1) Glue both joint edges; slide 1st joint together 2) Push 2nd joint closed 3) Nail or screw this joint first 4) Nail or screw this joint second. Notes: Panels are marked "TOP" - trim from the bottom only. Cap and base pieces are also marked as "CAP" or "BASE". Only use non-corrosive fasteners - galvanized, stainless steel, etc. Always follow glue and paint manufacturer's instructions. *Column must not be allowed to collect water, debris, etc. If the top of the column extends beyond the soffit/beam, the cap must be flashed with lead, copper, aluminum, etc. to prevent accumulation.